I have designed and built a new MPT style worktop for use with Bosch or Sortimo L-Boxxes! This new worktop has the same system of 20mm holes as the MPT and therefore can be used for some of the same tasks with some of the same accessories. I've also created a full set of plans similar to the MPT plans. For jobs where you don't have space to set up the full MPT or jobs that are too small to require it, this is the perfect solution. Measuring 20"x24" it gives a generous sized worktop and is also solid with a bolted connection. The MPT L-Boxx Worktop is designed to mount to an L-RACK-S quickly and easily with no major modifications to the L-RACK-S. By using an L-RACK-S to mount the top to, it gives space under the top to accommodate accessories such as clamps or Parf dogs and will also still accommodate an i-Boxx. The height of the worktop is adjustable by varying the number and combination of L-Boxxes that you use under it. It basically gives you a mini MPT that is extremely portable and can go along with you anywhere your L-Boxxes do. The MPT L-Boxx Worktop allows you to clamp work down in the same way that the MPT does and use accessories like the Parf Dogs to make the worktop into a mini track saw cutting table(see photos below). 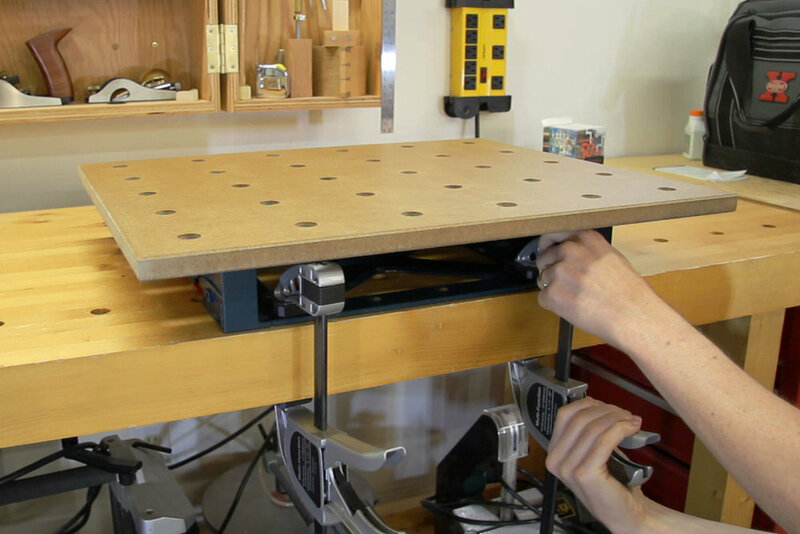 The worktop attaches to the L-RACK-S in seconds, with 4 machine screws that are captured within the L-RACK-S so there is no loose hardware to keep track of. Check out the video below to see how it mounts. The hardware setup is all detailed in the plans as well as the precise location of the grooves that get milled in the bottom of the worktop to accommodate the nibs and locking cleats of the L-RACK-S. The worktop can be quickly uninstalled from the L-RACK-S and it can be used as a normal L-RACK-S with L-Boxxes clipped on top of it again since the mounting hardware does not interfere with it's normal operation. As mentioned above, I have created a full set of plans and instructions showing in detail how to build your own MPT L-Boxx Worktop. The 12 page PDF package includes a cut list, hardware list, hardware source list, full colour dimensioned drawings and details as well as instructions with photos. Click on the button below to learn more about the plans or to purchase. See the MPT L-Boxx Worktop in Action! Click on any of the photos of the MPT L-Boxx Worktop in action to see a detailed description. 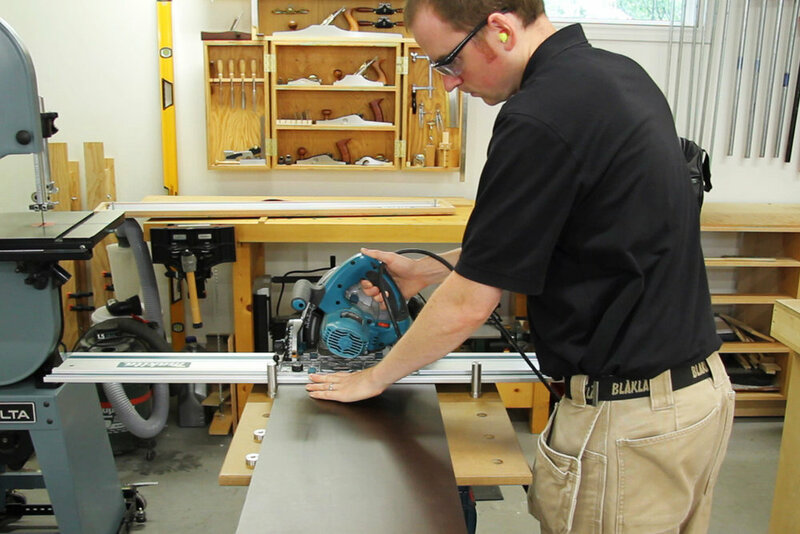 The worktop can be used for any variety of tasks including drilling, sawing, routing, sanding, miter saw stand, track saw cross-cut station or table saw outfeed support. There are also a couple of alternative ways you can use the worktop. One is to clip the MPT L-Boxx Worktop to a Bosch dust extractor which creates a rolling worktop for jobs that require that mobility. 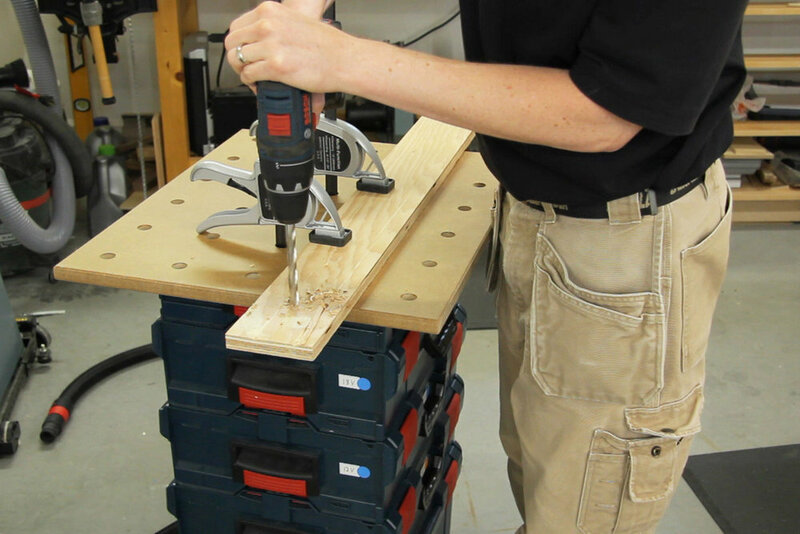 The second is the L-RACK-S can be clamped down to just about any surface such as a workbench, table or saw horses. This makes the MPT L-Boxx Worktop usable virtually anywhere regardless of how many L-Boxxes you have.